Like most of us, my body too has a tendency to build up a lot of body heat and have a lot of acidity problems from time to time. especially as I am recovering from my fever (since New Year's eve), I have been taking a lot of antibiotics and they, as we all know have their side effects and generate unwanted acids in the stomach which in turn results in a burning sensation that leads to Acidity. Not a good feeling, I tell ya! Instead of popping antacid pills for cure the problem, I turned to some natural remedies. Alkaline foods like bajra, jowar, bananas, mint, ladies finger etc aid in reducing this acidity problem. ..so is the today's recipe - "Minty Stuffed Parathas" which I made for today's dinner. Served with cool raita, they tasted fabulous. Acidity or not, I think these make a lovely meal at anytime of the day. Mint has got many medicinal properties and is very well known to relieve acidity. Last night for dinner, I tried my hand on these absolutely delicious and mouth-watery parathas stuffed with veggies like cabbage, potato and peas. I think to keep the acidity at bay, there could be a no better way! Adapted from Tarla Dala's Acidity Cookbook. 1. Blend into a puree - 1/2 cup mint leaves, little lemon juice, 1/2 tsp cumin leaves, 2-3 green chilli pieces along with 1/4 cup of water. 2. Mix the prepared mint paste with about 1.5 cups of whole wheat flour (atta flour), 1/2 cup bajra flour (optional, if not just use 2 cups of atta flour), 1 tsp of oil and 1 tsp of salt. Knead with about 1.5 cups of water, adding little by little into a soft dough. Rub a little oil on top and cover with some plastic wrap. Keep aside and rest for a while. Sprinkle salt over 1 cup of cabbage. Keep aside for 10 mins. Then squeeze out the water using your hands. Cut 2 potatoes into halves and boil for about 10-15 mins, until tender. Peel out the skin and mash into a bowl. Microwave 1/2 cup of frozen peas (no need to thaw) with little water for 2-3 mins. Drain water and mash. Heat a tsp of oil in a pan and add potatoes & green peas. Cook for 2 mins. Don't add any water. Add the cabbage & cook 2-3 mins. Finally add 1 tsp of garam masala, little turmeric, 1/2 tsp of red chilli powder. Season with salt. Mix well. Allow it cool for a bit. 4. 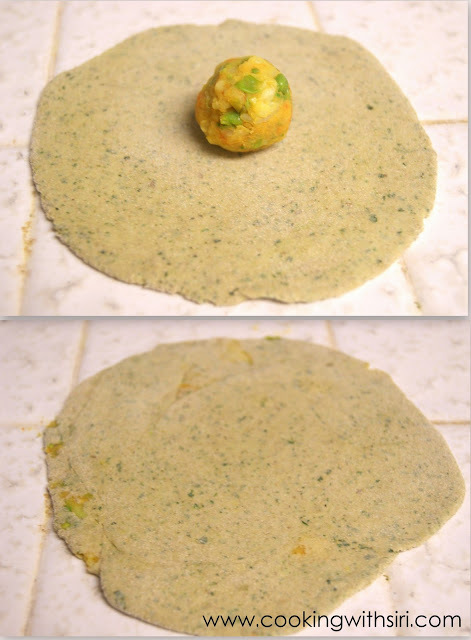 Take a lemon sized ball of dough & roll out into a chapati. 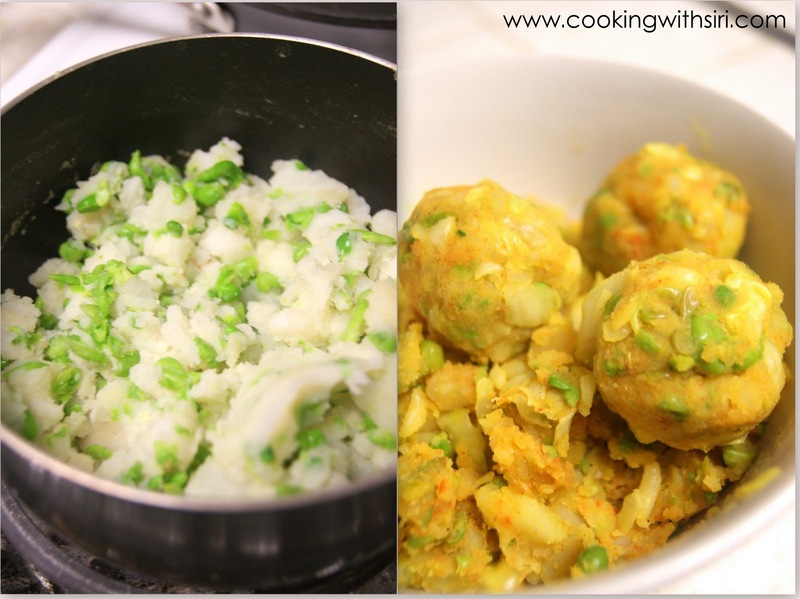 Put about 1 tbsp of vegetable stuffing on each roti, close into a dumpling. Roll out slowly into a paratha. 5. Cook each paratha on a non-stick pan until you have small brown spots on each side. A little tip is to slightly press through its edges with fingers (on the pan itself) if you think the edges are a bit dough-y. Brush little oil and Store in aluminum foil until it is ready to serve. These parathas freeze beautifully. Make them ahead, cool a little, fold them in aluminium foil and put them in a freezer bag. Refrigerate or Freeze. I have made a couple for my breakfast tomorrow morning. Sending these minty goodies to Sanjeeta's WholeWheat for Breakfast event. Hope you all had a relaxing weekend and all geared up for the week ahead. You all have a good one and take care. Love the flavors of mint...delicious paratha!! Hope u are well now. I know the acidity reign. I have problems with it too, just that mine translate into migraine and all i want to do is curl up and die. Wow looks absolutely gorgeous .. wish i can have one right away.. awesome pictures. Love this Paratha..The clicks are very beautiful..Addition of mint enhances flavor of these yummy parathas..
Wow :) that is one appetising paratha....a sure fire remedy I rely on (long term) for acidity is to include a cup of yoghurt at almost every meal. These paratha look delicious and I read with great interest the fact that they are a cooling food! 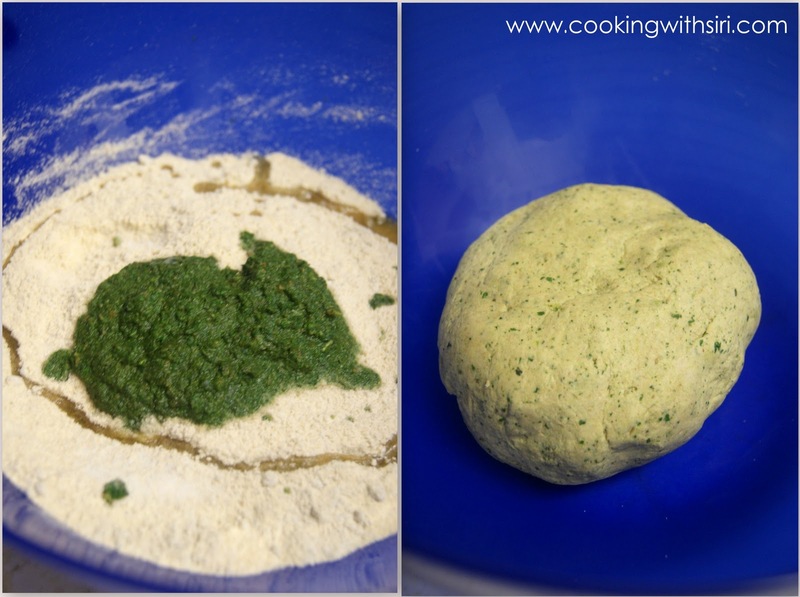 Loving the mint flavor with the parathas...beautiful step-by-step pictures..